Hawaii Native Status: Introduced. This naturalized food and beverage plant is native to Ethiopia and parts of Sudan and Kenya. Flowering Season: Mainly in the spring. The fruit is harvested from September to January, but the peak time is in November. Description: The starlike flowers are in dense clusters of up to 10 at the leaf axils. The individual flowers are white, tubular, up to 1/2 inch (1.3 cm) long, and usually 5-lobed. The flowers are followed by fleshy, red, egg-shaped to ellipsoid, up to 2/3 inch (1.6 cm) long fruits that usually contain 2 large seeds commonly known as coffee beans. 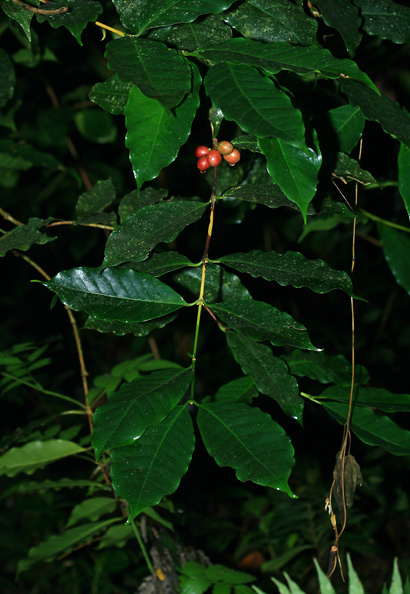 The leaves have rippled, undulating margins and parallel, pinnate veins and are glossy dark green above, light green below, hairless, opposite, and oblong-elliptic to narrowly egg-shaped with a pointed, tapering tip. The bark is thin, light gray, and becomes fissured with age. 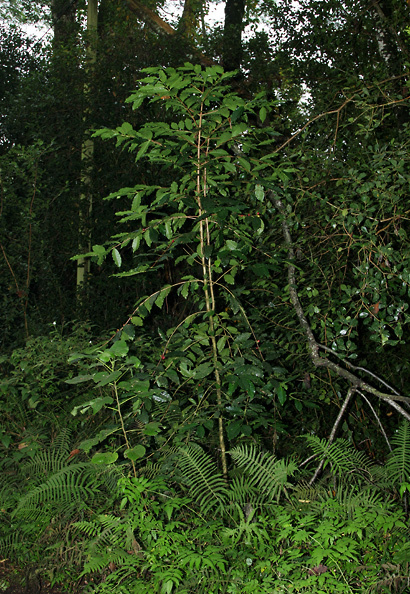 The plants have an upright growth form and spreading, often somewhat drooping branches. Here in Hawaii, Coffee is commercially cultivated in coffee plantations on the mountain slopes, but it also grows wild in the lightly shady understory of wet to mesic (moderately wet) forests at lower elevations. The wild plants are propagated by bird and animal-dispersed seeds. Edible – The edible roasted coffee beans (seeds) are used to make coffee and other coffee-based beverages and used as a flavoring for other foods like deserts, candies, and liqueurs. 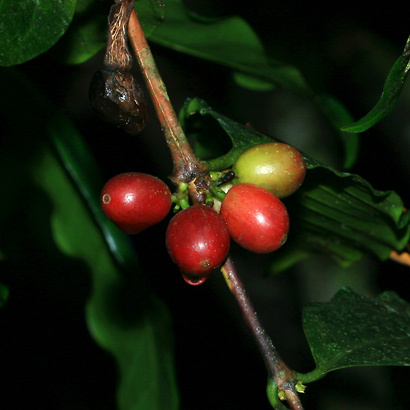 The also edible slightly sweet, red, fleshy outer layer of the fruit is removed and the coffee bean inside is roasted and then ground and brewed. Coffee beans contain caffeine, a mild stimulant that is also used for medicinal purposes like the treatment of headaches. The flowers are visited by honeybees and produce sweet, light-colored honey.